During 23-26 November 2010, the most influential international trade fair in Asia-Pacific-International Construction and Machinery Exhibition (Bauma) will be hold on in the Shanghai New International Expo Centre. As the leading manufacturer in mining machinery industry, Shanghai Zenith will show their vigor and quality in pursuit of excellence. Shanghai Zenith Company’s booth is set in E4.448. On this exhibition, the exhibits include MTW Series Trapezium Mill, JC Series Jaw Crusher, HP Series Hydraulic Cone Crusher and PF Series Impact Crusher. The products hold the concept "energy-saving environmental protection, technological innovation". MTW Series European Trapezium Mill is the latest grinding equipment researched and developed by our company’s experts based on more than 10 years researching experiences of MTM series industrial grinding mill and according to thousands of grinding mill users' opinions. JC series jaw crusher using a number of the world’s most advanced technology and manufacturing processes in addition to keep the advantage of the PE series jaw crusher, Its high quality and low cost makes it the best choice for crushing and screening equipment. HP series hydraulic cone crusher adopts computer optimization design to speed up main shaft speed. The unique crushing chamber replace system can quickly replace components in crushing chamber to meet different size requirement. PF series impact crusher has been proved that this series of crushers not only effectively increase productivity and final product quality, but also easy operation and maintenance. It is reported that Bauma China 2010 total exhibition area will reach 23 million square meters, it will attract more than 1,700 registered exhibiters and visitors are expected up to 12 million. As a marketing platform of innovative products and technologies, Bauma China enjoys the first exhibition in Asia in the world of construction machinery. 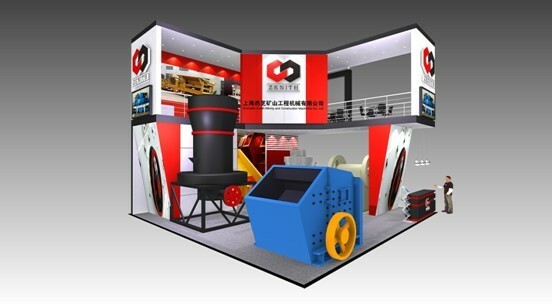 in this exhibition, Shanghai Zenith will show the extraordinary strength of China mining machinery, meantime, more and more customers will understand Zenith' growth in fighting for world-class brand.